Can someone please help? I am new to anesthesiology coding and am a bit confused. I just took an old webinar from AAPC thinking it would help, but it has confused me more. First question - which code would you use for a Laparoscopic Appendectomy? Would it be 00840 or 00860? I had picked 00840 but this webinar stated that it should be 00860 - even though the CPT book does not state including laparocsopy like code 00840 does. Second question - from what I have been trying to figure out, we bill the insurance based on the base units and time. My question is how do you do this? I have printed out a list from CMS on the base units, but I am confused on how that would be applied to the claim form and how would I bill the time - for both commercial and Medicare? Also, the modifiers confuse me - do I use the P modifiers, the AA modifier and of course my Anesthesiologist is a Locum too! And how would I find and apply fees? I have to code these services and then forward them over to someone to post into the billing system, so I need to have the total $ charges listed for her too! If anyone can explain this to me I would apprecaite it! I feel very clueless and am not getting anywhere trying to find my answers! As for your first question, 00840 is the proper code for a lap appy. 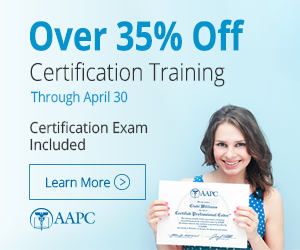 If an AAPC course told you otherwise, be sure to let them know the error so they can correct it. As for modifiers and billing, some of this will vary based on payer requirements. It's always a good idea to get to know your payers and how they want you to bill. Which concurrency modifiers you use will depend on your practice. If you bill for an anesthesiologist and he/she always works alone, you will use AA. If your doc works with CRNAs or you bill for CRNAs, you will need those modifiers as well. For some payers (including Medicare) you need QS to report MAC when that is the mode of anesthesia. You also want to use the physical status modifiers. Some payers will allow extra payment for these and some won't but it's a good idea to include them. Fees are pretty straightforward. Add the base units (RVG value) to the time units (1 unit for every 15 minutes - Medicare wants this down to the minute, no rounding. most others want it rounded. We round up for 7 minutes or more and down for 6 minutes or less) plus any modifying units (for example, P4 = 2 units, 99140 = 2 units) and multiply the result by the doc's fee. Sounds like you're going way beyond what most coders do. I'm surprised the billing system doesn't do the charge calculations for you. It also sounds like you're working without a Crosswalk and RVG. I highly recommend you get these. I can't imagine coding/billing anesthesia without them. Hope this was some help. Good luck! Thank you gost! Your answers are very helpful! Now I understand much better. I just had anesthesia coding dropped on me and I don't even think they have our system set up yet to accept the posting of these charges. I have to code everything and then pass them on to our posting person. She just enters everything in to the system as given, so I need to give her the fees and all. I will have to get a Crosswalk and RVG - I wasn't sure what they were to begin with . As far as the fees, they haven't even set those yet. I think they are expecting me to come up with those. We usually use our Medicare allowed amount as the base - but I am confused on the Medicare conversion factor. Does this represent each base unit? How would this amount figure in if Medicare wants it calculated by every minute? I understand 1 unit for every 15 minutes, but am still confused on the Medicare billing - and does the acutal time have to go on the claim or just the units? Thank you so much for your help and patience - this has made me feel really dopey! No need to feel dopey. Sneezy maybe but not dopey. For most payers (maybe all but Medicare) fees are easy. Let's say you're billing 00840, the patient is a P3 status and this was an emergency surgery. 00840 has 6 base units. Add 1 unit for P3 and 2 for the emergency. That is 9 units. Now let's say the anesthesia time was 70 minutes. For most payers, that is 5 units (some will only allow 4). Add this to the base for a total of 14 units. Medicare wants actual time so 70 minutes is 4.7 units. 4.7 + 9 - 13.7. $100 x 13.7 = 1370.00. Still easy but not as easy as everybody else. Oh, by the way, Medicare (and some other payers) will not pay for the physical status modifiers or the emergency condition. Check with your local carrier about billing requirements but I think it's okay to bill them, you just won't get paid for them. LOL - ok Sneezy it is! Thank you so very much gost - now that makes sense! I really appreciate all of your help and how you explained everything so I can understand what to do now! There are many resources available. If you are going to be doing any amount of anesthesia coding/billing you might want to invest in the RV Guide and Crosswalk available from the ASA (American Society of Anesthesiologists). Please PM me for further anesthesia related coding/billing/compliance questions. how do you append an anesthesia code where the pt is a P3-E, not just a plain P3? I added the ET modifier and my coding program warned me that this modifier doesn't apply to the anesthesia code. Any insight from anyone would be helpful.